Well, since that time I've been stitching the donated socks to the recycled felt. (The 100% acrylic felt was originally packaging material for brand new kayaks and canoes being shipped to River Runner.) At last the top is complete! I've also just acquired a great plastic tarp from my friend Jane Friedman. Her family had no further need of camping gear and needed to "dispose" of it. Thus, the sock art quilt will have a repurposed backing. More photos coming! Yet, I didn't use all the socks on the quilt. There were frankly too many blue and black dress socks and white athletic tube socks. One sock was donated long after all the socks were pinned and mostly stitched....but it inspired me! How could it not! Thus, I created a miniature art quilt featuring this particular sock with a few of the other "leftovers"! 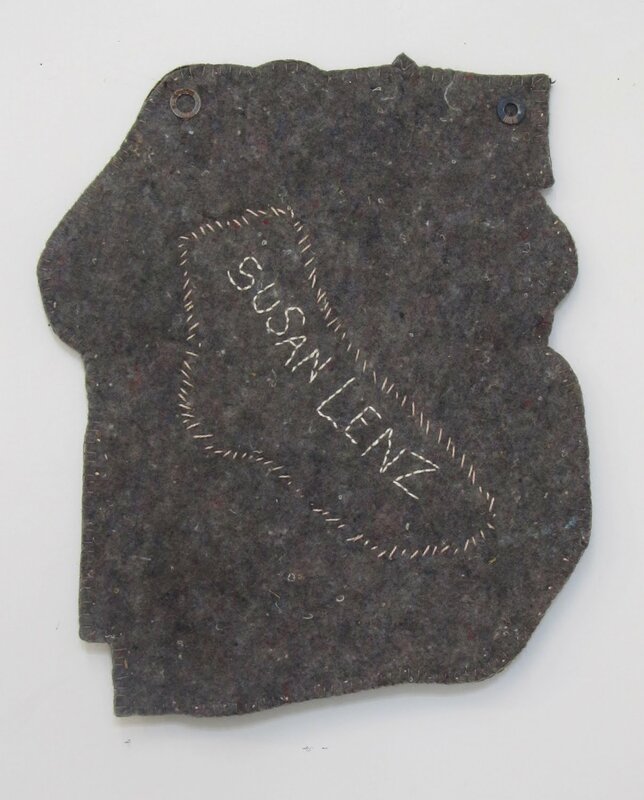 The batting for this miniature quilt is more of the recycled acrylic felt from River Runner. The back, however, is repurposed acrylic auto upholstery felt. Socks, however, are not occupying all my time. 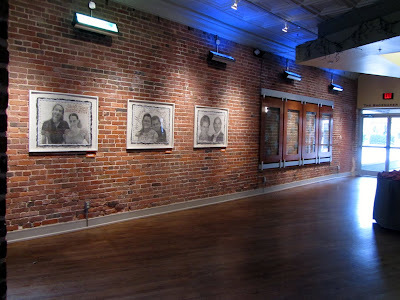 Just yesterday I installed a selection of my Decision Portraits at the Warehouse Theatre in Greenville, South Carolina. 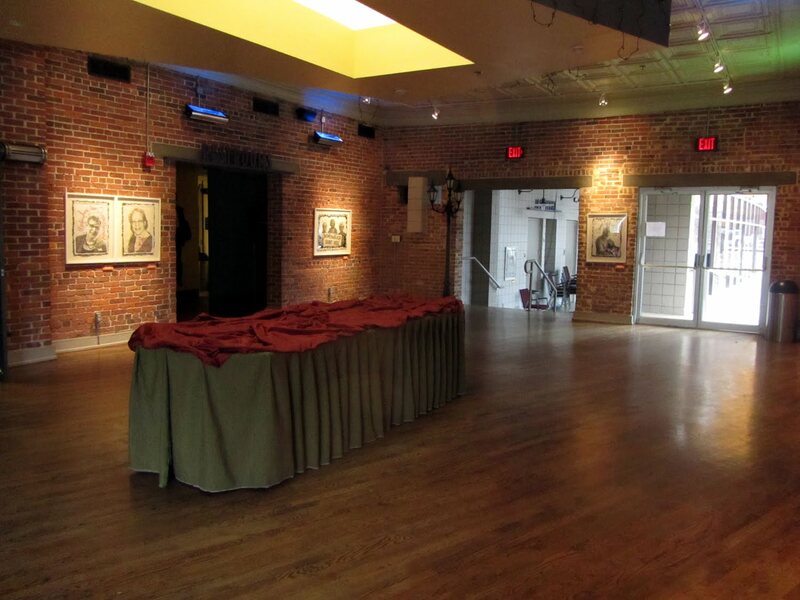 The artwork will be on display during a run of Edward Albee's Who's Afraid of Virginia Woolf? starring Mimi Wyche, Chip Egan, Debra Capps, and Brock Koonce, January 21 - February 5th....although my exhibition will be up through Wednesday, February 23rd....when I'll give an "artist's talk" before taking down the work. The first photo was taken from the front door. The photo above is the view back toward that front door. Above is the interior wall with a break leading to the restrooms. The concession area is just off the image area above on the left. There are stairs leading down to the theater just off the image above to the right. 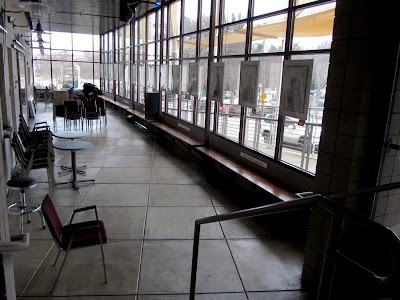 The short flight of stairs from the central lobby bring audience members to the theater seating. This wide, long hallway includes the window treatment above. 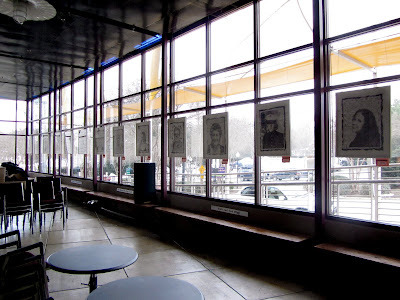 I hung fifteen Decision Portraits from a provided black metal ceiling grid in front of the windows. Title cards are placed on the lower right side of each piece. 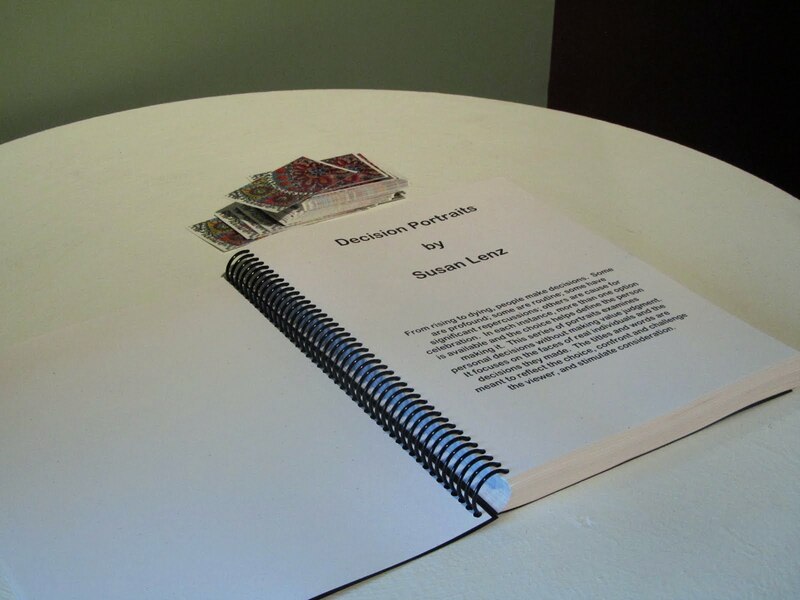 Yet, in one sense, all 107 portraits are there because I printed another book with the story behind each piece. The pedestal below is right inside the front door! 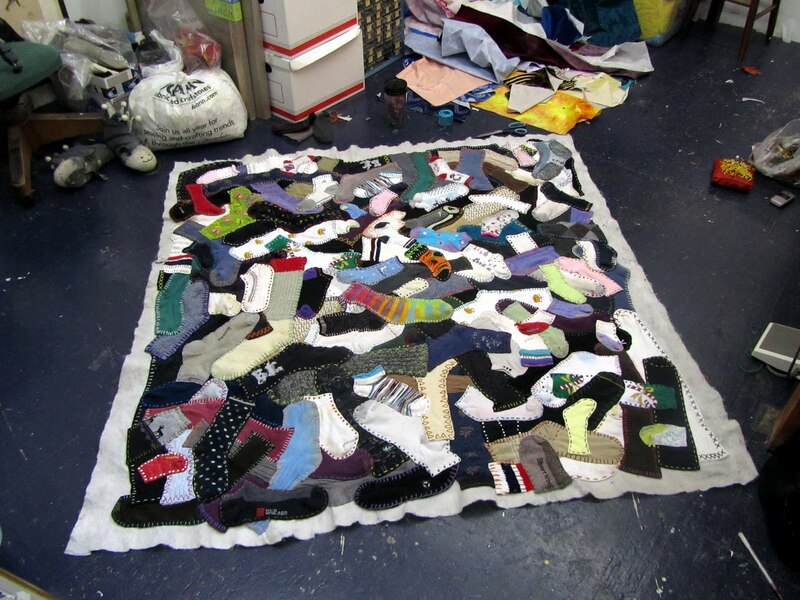 Love the sock quilt, what a great idea. Brilliant! I just LOVE the sock quilt! 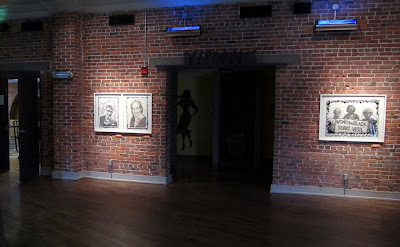 Love the sock quilt and love seeing my portrait in another venue!! You do the coolest most unique projects in textiles I've ever seen. Your ideas have show such freshness...I dig that! The huge sock quilt came out beautifully. Your hand stitching just the perfect touch! the small quilt is truely genius. 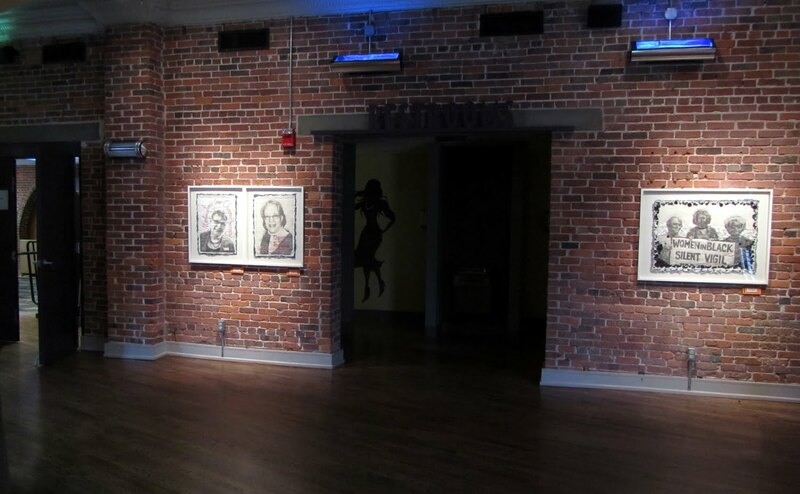 the art on the brick walls looks amazing! Love seeing it all in the theater areas for patrons to see while waiting...perfect selections! You are so talented! 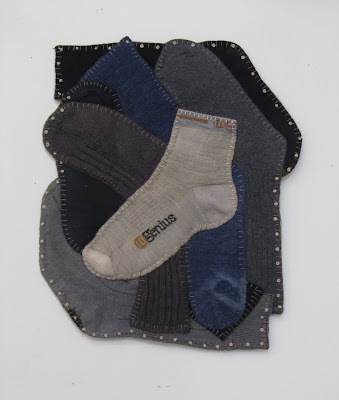 Sock quilt rocks!